Education-Based Inequality Increased In 2010 « Mandel on Innovation and Growth. Chart’s Y axis is an index, not a $ value. All categories of workers have seen a drop in earnings. More startling is that withing the Advanced degree category a small minority account for most of the high wages. See link for full story. None of this is specific to Spokane. via Pedestrian Struck By Spokane Police Patrol Car Dies – News Story – KXLY Spokane. Witness statements describing attributes of this collision are here. More on Spokane’s out sized number of officer involved shootings and deaths here and here. The Spokane Police Department has a long history of corruption, according to the true story account Breaking Blue. Today, the local paper notes the local police have a history of poor civilian oversight-which has contributed to much of the community no longer trusting either the police or local government. The City has also routinely filed suit against those who file complaints about a police officer’s behavior. See also this new item on the River Park Square scandal. How much do you think someone with a Masters degree in statistics, marketing, finance, or business administration is likely to be paid for work described as an “executive role”? This individual will be working in an executive role with a variety of responsibilities. He or she will be preparing financial forecasts, data analytics, and business case development. This individual will be performing market research using traditional research methods as well as working on cross functional teams. He or she may take on a project management role as well.The most qualified candidate should have a bachelor’s degree in statistics, marketing, finance, business, or a research related field. A master’s degree in the above listed fields is desired. How much do you think such a job ought to pay? This position has a wage of $18-$20/hr. And they want an experienced worker, preferably someone who has been in the banking industry. 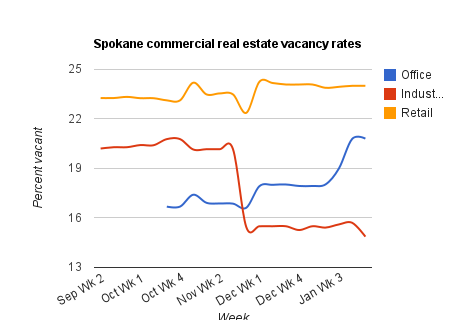 That is the reality of the Spokane job market. via Market Researcher Job in Spokane 99252, Washington US. What a dramatic example of Spokane’s chronic low wages for those not in the government or health care sectors. According to the Spokesman-Review, SIA’s passenger counts rose by 4% from 2009 to 2010 coming in at about 3.2 million. This supports that the local economy has approximately bottomed. Different sectors may reach a bottom at different points in time – we might, for example, see continued weakness in real estate this year due to foreclosures and too many developments still idle from the housing bubble. The updated passenger count brings the 2010 number to on par with 2004 and just slightly below the 1996 total. via The Genius of Portlandia – Grant McCracken – The Conversation – Harvard Business Review. And that applies to local business and political leaders too – so as not to act with fear when someone mentions a flash mob. What’s Wrong With America’s Innovation Policies – Bruce Nussbaum – The Conversation – Harvard Business Review. As long as I can remember, there has always been political talk of the need for “more science education” and innovation. None of this will do a bit of good unless the financial incentives are aligned to encourage more to pursue innovation careers. Innovation is not exclusively about science and engineering either – innovation can occur in business processes, manufacturing processes and service delivery and the arts too. Innovation is about a state of mind. The President is pushing a constrained view that innovation is about science and engineering and mostly comes from those with college educations. The good news is the President mentioned “innovation” and recognizes its importance in a globally competitive world. But like the HBR column linked above, both missed the key attribute: innovation is a state of mind. It’s not science, engineering, more teachers, more college graduates, more government funded R&D and big corporations lobbying for more government innovation funding or tax breaks. Innovation has to be a way of life and that means continuous change itself must be embraced. More from Mike Mandel, Ph.D., here.